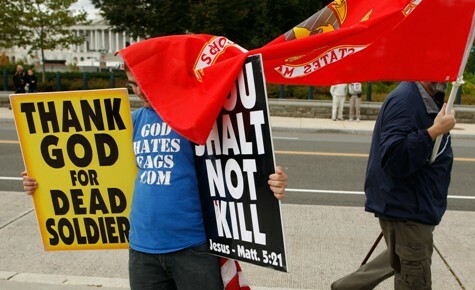 The Westboro Baptist Church’s showdown this week with Marine father Al Snyder in Supreme Court has been widely covered, including in a first-person account on this blog. However, a Battle Rattle reader pointed out an interesting thread that I had missed: One man’s quiet protest to the Westboro message. 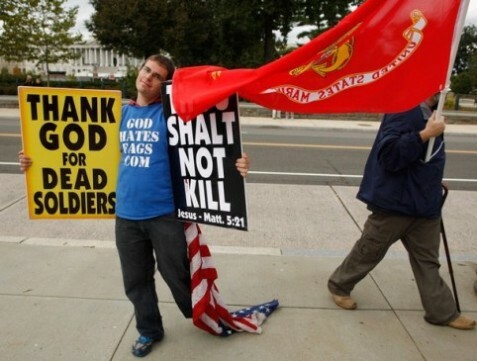 On Wednesday, dozens of Westboro protesters picketed outside the Supreme Court, with many of them carrying the same kind of signs used to protest outside the funeral of Lance Cpl. Matthew Snyder in 2006. If you’ve been following along, you know the “Thank God For Dead Soldiers” drill. Call me crazy, but I do think these images might bring a smile to some of our faithful readers. Yes, that it truly does! Awesome! That’s what I’m talking about! Much appreciated!!! Semper Fi. Oorah! Like they say…The Few, The Proud. This just shows off that pride…for our Country and our Corps. Way to send a message! Semper Fi! As a retired General that buried 4 soldiers, I”m glad that that bunch of nuts did not show up at any of those funerals, because if they had, I would now have a criminal record. “Assault with intent” as a minimum. Too bad this church group and it’s followers do not understand that GOD hates no one. What God are they talking about??? Leave these families alone to mourn their loss in peace. Alright Marines, it’s time to organize and do something. We are in every state of this country. I am sure we can get dozens of us to turn up for each and every event these jackasses want to put on, so what’s stopping us? We just need to organize and start making it happen. I know I have a job now, and a family, so I can’t just drop everything and do what I want to do to these oxygen-thieves, and I can’t travel the country to every event they show up at, but I can be there to put another flag in their face whenever they are within my area, and all of you can do the same. We can be there and we can together outnumber them and show the country that once again, Marines are leading the way. I didn’t have it all planned out when I showed up at the Supreme Court the other day, and I don’t have it all planned out now, but what I do believe, is that I did the right thing then and I’m doing the right thing now. We need to make this happen. We’ll work on the details as they come, but lets start to communicate and organize. It is unacceptable what these scumbags are doing. We need to do what we can, unfortunately within the constraints of the law, to drown them out. Email me. Every single Marine, or supporters of Marines, and let me know where in the country you live. Let me know the radius you are willing to travel. I will start monitoring these pigs site and trying to organize groups to show up and counter-protest. We can figure the rest out together, but band of brothers, we need to band together starting now and once again serve our country to protect those too weak to protect themselves. I look forward to hearing from all of you. Gents that write for the Marine Corps Times, I’d be very appreciative if you could help somehow to get the word out, get this email address out, and help me get this moving. My apologies to my sisters out there! I meant no disrespect, it’s just that my job was only around other male Marines, so I forgot the sisters part, but we need you too! Those pictures are great! Love it! We’ve already got it covered, Marines. While you’ve been out on the front fighting the battle, we old warriors have been protecting the fallen. Go to http://www.patriotguard.org and join us. I honored fallen Marine LCpl Osse last week, SrA Mark Forester yesterday, and PFC Dawson tomorrow. All are tragic losses. I pray for an end to these losses, but until that time comes we’ll be vigilant on the home front to ensure no other parent endures what Mr Snyder did. Thanks Tommy! Just went and checked out the site. While I get nervous about the fact that you guys are charging money for things, and I was hoping this wouldnt be a “trademarked” issue, I also see a lot of time and organization that in the end, will likely lead to better support for our fallen. With that said, I did not have any help down at the Supreme Court the other day. Not sure how that was missed. I will redirect my attention and devotion to your site, and ask those that have already emailed me to do the same. To the editors of Marine Corps Times: can the Patriot Guard be advertised somehow in the Times so we can dramatically increase the number that are supporting them. With all of us that are Marines, the familes of Marines, supporters, etc, there should be no advertised event these WBC loons attend that we are not overwhelmingly attending as well. Hello I just now stumbled across your site from google and I really had to say what a terrific read this was in fact! However, I am trying to add your current RSS feed but Im having problems discovering it. are there no covert SPECIAL special squads who could remove this menace from American Military funerals ?? or do we wait until we kick out the communist-in-chief in the WH and all of his thugs in Nov 2012. That bro with the signs better pick that flag up off the ground and treat it with some respect…..